If you have delicate, sensitive skin, here is a natural product to rejuvenate and maintain healthy skin. Contains the maximum concentration of McArthur Pawpaw Extract™. It’s suitable for all dry, oily and combination skin types. While it is ideal for maintaining a healthy complexion, it can also be used anywhere on the body. This cream has No Added Fragrance and was created for people with the most sensitive and allergy-prone skin. Fact: The pawpaw fruit is packed full of vitamins, antioxidants and enzymes which give it a natural ability in rejuvenating the skin - it’s the skin’s natural friend. McArthur Skincare's Complete Skincare Cream has the highest amount of pawpaw extract in a natural cream on the market - an amazing 60%. This one item, our Complete Skincare Cream, can replace a number of products on your cosmetic shelf. 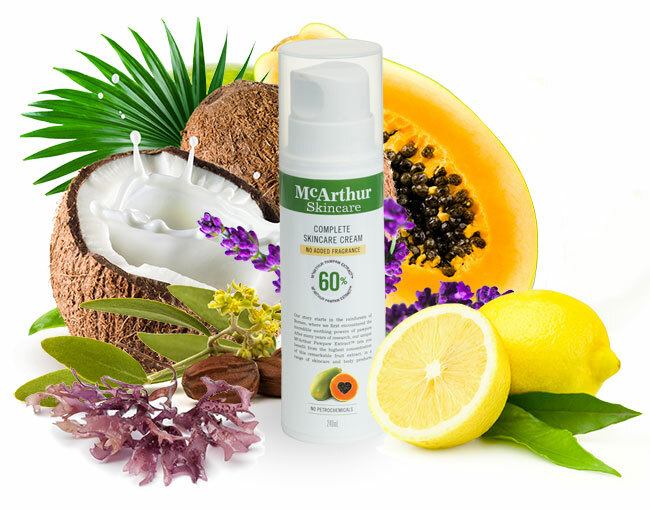 McArthur Skincare's Complete Skincare Cream is a versatile all-in-one moisturiser that can relieve dry skin and redness leaving your skin feeling fresh and revitalised. This cream is powerful enough that a little goes a long way, so use it sparingly. When you consider its high concentration, it’s clearly less expensive than other brands, which contain much less pawpaw extract. This truly is liquid gold! Fresh, vibrant-looking skin does a lot for your appearance. A sound skincare routine is a must if you want to look your best! To maintain a youthful looking skin, McArthur Skincare's Complete Skincare Cream is your daily skincare routine. Our Complete Skincare Cream No Added Fragrance, together with the high concentration of our active McArthur Pawpaw Extract™, contains other natural ingredients - building blocks towards healthy skin. It is said that skin is the largest organ in the body, and maintaining skin health is for your overall well-being. Do your sensitive skin a favour and try it. You are protected by our Money Back Guarantee. 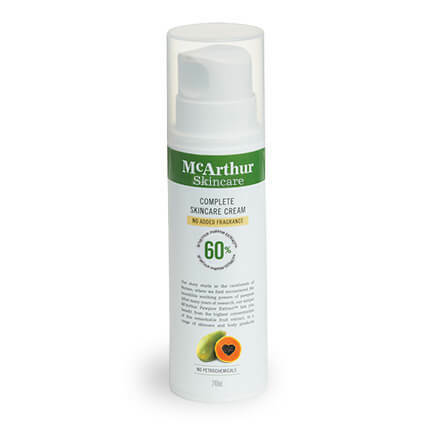 Containing 60% McArthur Pawpaw Extract™, our Complete Skincare Cream with No Added Fragrance has the highest concentration of Pawpaw (Papaya, Papaw) extract in a natural cream. McArthur Skincare's Complete Skincare Cream No Added Fragrance purifies, soothes and rejuvenates the appearance of the skin. Helps to relieve skin redness and dryness. At McArthur Skincare, we are dedicated to creating products that use natural active ingredients. Our McArthur Pawpaw Extract™ was produced to enable us to incorporate very high concentrations of this Pawpaw extract into our skincare and beauty products. McArthur Pawpaw Extract™ is exclusively produced by us. We use Australian grown pawpaw. Main active ingredient: natural Pawpaw (Papaya, Papaw). The Complete Skincare Cream No Added Fragrance also has natural ingredients including those derived from Coconut, Jojoba Seed Oil, Seaweed and Citrus Fruits. If you have delicate, sensitive skin, you need to take extra care to restore skin to good health. McArthur Skincare's Complete Skincare Cream No Added Fragrance is ideally suited to bring you the finest skin care using active natural ingredients.